Fifth pick Stelvio captured his first G1 victory in this year’s Mile Championship to reign as another three-year-old mile champion following last year’s Persian Knight. Scoring two consecutive wins in his first two starts as a two-year-old, he was runner-up in the following Saudi Arabia Royal Cup (G3) and the Asahi Hai Futurity Stakes (G1) then marked his first graded victory in his kickoff start this year, the Spring Stakes (G2). While finishing fourth and eighth, respectively, in the Satsuki Sho (Japanese 2000 Guineas, G1) and the Tokyo Yushun (Japanese Derby, G1), he came off a runner-up effort in the Mainichi Okan. He has marked 4-3-0 out of seven starts between 1,600 and1,800 meter distances including this race. This win marked trainer Tetsuya Kimura’s first G1 and eighth graded win since establishing his stable in 2011. This was also the first JRA-G1 win for jockey William Buick, who is riding in Japan from yesterday under a short-term license for the first time in four years. 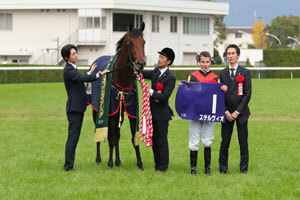 This is his fifth graded victory in Japan. Fifth pick Stelvio broke smoothly from the innermost stall, settled toward the front and waited along the rails while his rivals traveled wide to make bid turning the corners. Entering the lane around fourth from the front, the son of Lord Kanaloa unleashed a powerful kick, overtook Al Ain 100 meters out and pulled away strongly while holding off the strong challenge by the defending champion. “It’s my first G1 win in Japan and this race is obviously one of the world’s biggest mile races so it’s very special for me. The horse was in great condition and when I saw he was drawn one, I thought that if he can make use of the draw and get a good position, he has a chance, which the horse managed to do. He had a good finishing kick. He won like a class horse and hopefully this is the beginning of this horse’s G1 career,” commented jockey William Buick. Third pick Persian Knight stalked Stelvio by the rails and challenged the three-year-old bay with an impressive late charge before the wire but was a head short of defending his title. Fourth choice Al Ain rushed out to travel second or third behind frontrunner Aerolithe, took the front around the 200-meter marker, was overtaken by Stelvio then by Persian Knight in the last 100 meters but held on well to cross the wire in third. Race favorite Mozu Ascot eased back after a good break to travel fifth or sixth from the rear, steered toward the inside after entering the stretch but was unable to find a clear path and finished 13th. T. Kimura Sunday Racing Co., Ltd.
Y. Ikee G1 Racing Co., Ltd.
Y. Ikee Sunday Racing Co., Ltd.
K. Ikezoe Kanayama Holdings Co., Ltd.
M. Nishizono G1 Racing Co., Ltd.
Ke. Fujioka Silk Racing Co., Ltd.
Y. Hatakeyama Win Co., Ltd.
K. Sasada Lucky Field Co., Ltd.
T. Kikuzawa Sunday Racing Co., Ltd.
Y. Yahagi Capital System Co., Ltd.
K. Nishiura Him Rock Racing Holdings Co., Ltd.
Note2: Figures quoted under Odds are Win Odds, which show the amount of money you get back per single unit (100yen), and Fav indicates the order of favorites. Note1: Underlined bold number indicates the winning horse. Note2: Horse numbers are indicated in the order of their positions at each corner, with the first position listed first. Two or more horses inside the same parentheses indicate that they were positioned side by side. Hyphens between the horse numbers indicate that there is distance between the former and the latter. The asterisk indicates a slight lead. The Mile Championship is one of the most prestigious autumn grade-one events for milers together with the Yasuda Kinen (G1, 1,600m) in spring. Horse racing in Japan had been focusing on long distance racing for a long time, regarding stamina and strength as the most important quality of horses. However, with modern racing having increased its attention to speed horses suited to a mile or shorter distance races, the Mile Championship was established in 1984 in conjunction with Japanese races adopting the grading system. The current racing program now provides races for short, middle and long distance racehorses. The race welcomed several foreign contestants in the past; Special Kaldoun (IRE, by Alzao;9th), Tout Seul (IRE, by Ali-Royal;16th) in 2003—first since being designated an international race in 1998—, Rakti (GB, by Polish Precedent;14th) in 2004, Court Masterpiece (GB, by Polish Precedent;7th) in 2006, Becrux (ITY, by Glen Jordan; 8th) in 2007, Rahy's Attorney (CAN, by Crown Attorney;9th) in 2008, Eva's Request (IRE, by Soviet Star;10th) in 2009, Immortal Verse (IRE, by Pivotal; 7th) in 2011 and Sahpresa (USA, by Sahm) in 2009 (3rd), 2010 (4th) and 2011 (3rd). Last year, Persian Knight became the first three-year-old to win the Mile Championship since Agnes Digital (USA, by Crafty Prospector) in 2000. He came off a fifth in his first start of the fall campaign, the Fuji Stakes (G3, 1,600m; Oct.20), to defend his title this year. Fuji Stakes winner Logi Cry and fourth-place finisher and last year’s Mile Championship runner-up Air Spinel were also among the lineup. Runners coming off the Mainichi Okan (G2, 1,800m; Oct.7) were 2017 NHK Mile Cup (G1, 1,600m) and this year’s Yasuda Kinen runner-up Aerolithe (1st), victor of the 2018 Spring Cup (G2, 1,800m) Stelvio (2nd) and this year’s NHK Mile Cup champion Keiai Nautique (5th). This year’s Yasuda Kinen winner Mozu Ascot came off a second-place finish behind Lord Quest in the Swan Stakes (G2, 1,400m; Oct.27). Other notable contenders included the Keisei Hai Autumn Handicap (G3, 1,600m; Sep.9) champion Mikki Glory, this year’s Victoria Mile (G1, 1,600m) winner Jour Polaire and last year’s Satsuki Sho (Japanese 2000 Guineas, G1, 2,000m) victor Al Ain. Danon Shark (JPN, by Deep Impact) set the race record of 1:31.5 when winning the race in 2014.